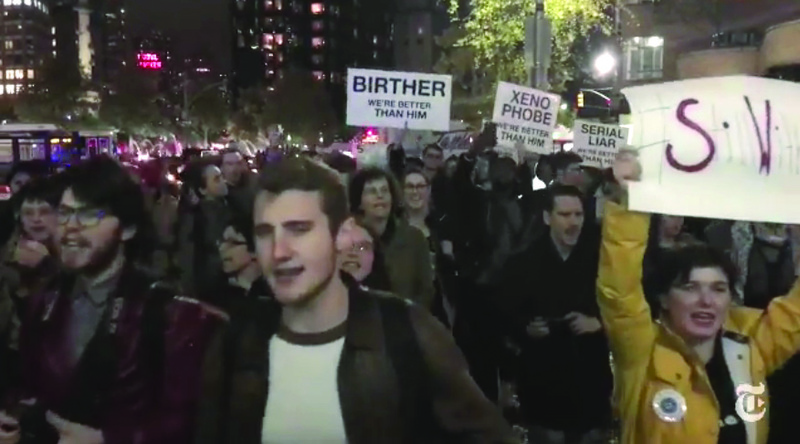 Thousands of people across the country marched, shut down highways, burned effigies and shouted angry slogans on Wednesday night to protest the election of Donald J. Trump as president. The demonstrations, fueled by social media, continued into the early hours of Thursday. The crowds swelled as the night went on but remained mostly peaceful. Protests were reported in cities as diverse as Dallas and Oakland and included marches in Boston; Chicago; Portland, Ore.; Seattle and Washington and at college campuses in California, Massachusetts and Pennsylvania. In Oakland alone, the Police Department said, the crowd grew from about 3,000 people at 7 p.m. to 6,000 an hour later. The situation grew tense late Wednesday, with SFGate.com reporting that a group of protesters had started small fires in the street and broken windows. Police officers in riot gear were called in, and at least one officer was injured, according to other local news reports. It was the second night of protests there, following unruly demonstrations that led to property damage and left at least one person injured shortly after Mr. Trump’s election was announced. One of the biggest demonstrations was in Los Angeles, where protesters burned a Trump effigy at City Hall and shut down a section of Highway 101. Law enforcement officials were called out to disperse the hundreds of people who swarmed across the multilane freeway. In New York, crowds converged at Trump Tower, on Fifth Avenue at 56th Street in Midtown Manhattan, where the president-elect lives. They chanted “Not our president” and “New York hates Trump” and carried signs that said, among other things, “Dump Trump.” Restaurant workers in their uniforms briefly left their posts to cheer on the demonstrators. The demonstrations forced streets to be closed, snarled traffic and drew a large police presence. They started in separate waves from Union Square and Columbus Circle and snaked their way through Midtown. Loaded dump trucks lined Fifth Avenue for two blocks outside Trump Tower as a form of protection. Emanuel Perez, 25, of the Bronx, who works at a restaurant in Manhattan and grew up in Guerrero, Mexico, was among the many Latinos in the crowd. Protesters with umbrellas beat a piñata of Mr. Trump, which quickly lost a leg, outside the building. The Police Department said on Wednesday night that 15 protesters had been arrested. Receive occasional updates and special offers for The New York Times’s products and services. Elsewhere in the country, college students gathered in spontaneous marches and asked university leaders to schedule meetings to reflect on the results. After Mr. Trump’s victory speech, more than 2,000 students at the University of California, Los Angeles, marched through the streets of the campus’s Westwood neighborhood. There were similar protests at the University of Southern California, in Los Angeles; University of California campuses in Berkeley, San Diego and Santa Barbara; Temple University, in Philadelphia; and the University of Massachusetts. High school students also walked out of classes in protest in several cities. As U.C.L.A. students made their way to classes on Wednesday, they talked about how to make sense of an outcome that had seemed impossible a day earlier. Chuy Fernandez, a fifth-year economics student, said he was eager to air his unease with his peers. “I’m feeling sad with this huge sense of uncertainty,” Mr. Fernandez said. The son of a Mexican immigrant, he said it was difficult not to take the outcome personally. On Facebook, a page titled “Not My President” called for protesters to gather on Inauguration Day, Jan. 20, in the nation’s capital. “We refuse to recognize Donald Trump as the president of the United States, and refuse to take orders from a government that puts bigots into power,” the organizers wrote.